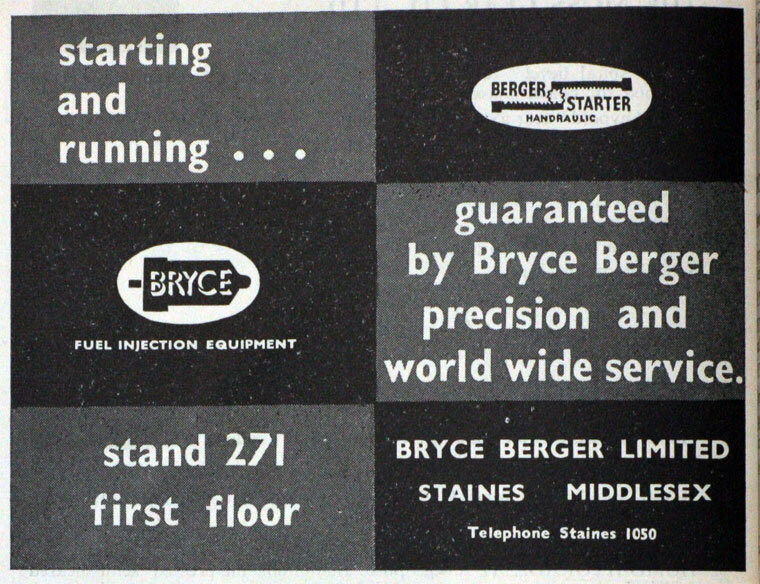 1952 Bryce Fuel Injection Ltd and Berger Equipment Ltd amalgamated as Bryce Berger Ltd; address Ironbarks Works, Staines . 1955 Subsidiary of Brush Electrical Engineering Co.
1958 Hawker Siddeley moved Bryce Berger to the Gloster Aircraft factory at Gloucester to provide space for expansion. 1960 C. A. Vandervell and Co purchased Bryce Berger makers of fuel injection pumps from Hawker Siddeley ; C. A. V. was a subsidiary of Lucas; the 2 ranges of pumps were complementary . 1961 Manufacturers of fuel injection, governing and starting equipment for diesel engines. 498 employees. This page was last edited on 25 April 2012, at 15:03.